Xpanse Premier Series rails are made with COMPOSICORE®, a precision-engineered polymer that contains no wood fibers or components, making it the most water-resistant core available. COMPOSICORE® won’t absorb moisture, rot, cup, warp, decay, or bow, and you’ll never have to deal with sanding or painting. 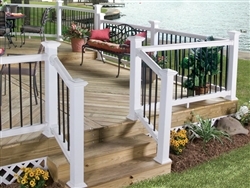 Your railing will never rattle or squeak and you’ll never have to paint again. As one of the leading manufacturers of residential and commercial fence and rail products, Xpanse products feature many enhancements for your added peace-of-mind. Standard in all Premier Series rail products is Composicore®, a precision-engineered polymer containing no wood fibers or components – making it the most water-resistant core available. It will not absorb moisture, rot, cup, bow, splinter, stain, warp or decay, and will resist mold and fungus. Xpanse products are strong and durable, and secure enough to keep children and pets contained in the yard. The low-maintenance characteristic of Xpanse products makes it ideal for any environment, as our fence and rail products can be easily cleaned with just a spray of a garden hose, or by using mild soap and water. In sunny and warm climates, Xpanse products won’t fade, as special UV inhibitors allow for fade resistant color and low-wearing color finish. And what better way for homeowners to have peace-of-mind then having our industry-leading limited lifetime warranty come with all your fence and railing products.